One of the most common reasons why garage doors break down is a lack of professional maintenance. Without regular upkeep, mechanisms of this type will inevitably suffer from wear and tear that can easily result in significant damage. We strongly recommend that homeowners invest in regular service appointments for their door system in order to avoid potential breakdowns and accidents. Regular maintenance is essential for your garage door to achieve an optimal service life. Our technicians know exactly what to look for, and can quickly identify problem areas and treat them with the appropriate solution. This means problems will be fixed before they develop into serious issues, saving you time and money in the process. Your overhead door is a complex system, and it takes a professional eye to pick out areas where maintenance is required. Our technicians will examine the many moving parts of the system, such as the rollers, hinges and springs, and lubricate them to make sure their performance remains efficient. We'll also examine the cables and the tracks to make sure they aren't damaged and are able to work properly. One of the most important parts of the system is the opener safety sensors, as they are responsible for preventing the door from closing while there's something blocking its path. During a regular maintenance appointment, our technicians will test the sensors and make sure they are able to properly detect an obstacle. If sensor realignment proves to be in order, or if the lenses of these photo-electric eyes become too scratched and they need to be replaced, we'll take care of the issue on the spot and test the door again afterwards to make sure it can in fact reverse the way it's supposed to. Every overhead door needs regular maintenance to make sure it's able to continue working reliably day in and day out. 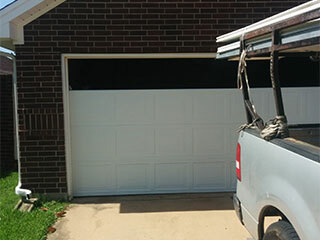 We highly recommend that you book a service appointment with our experts at Garage Door Repair Kingwood to prevent a lot of potentially dangerous malfunctions from occurring. Give us a call today to schedule an appointment. Our company has over a decade's worth of experience servicing all sorts of garage door systems. We follow strict guidelines that allow us to safely and effectively take care of any issue, regardless of the root cause of it. If you want to book an appointment, you can simply use our online scheduling system. Thank you for choosing Garage Door Repair Kingwood! One of our experts will be in touch soon. Feel free to browse our website for FAQ, tips and more useful information in the meantime!